Manufacturer & Supplier of Bag Filter Systems. Our product range also comprises of Storage Tanks, Roof Air Ventilator and Axial Flow Fans. We have carved a niche amongst the customers for providing large array of Bag Filter Systems. Our products are used for cleaning air and available in accurate dimensions. This Bag Filter Systems removes the solid dust from air thus cleaning it. We offer Bag Filter Systems to our customers as per the industry standards. scrubber system is a unit which seprates fumes that are mixed in air, sepration is done using water jets, and only clean air is let out to atmosphere. 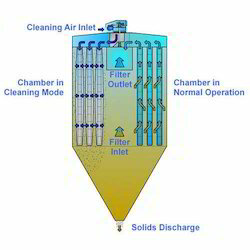 scrubber system are mainly used in chemical indutries. Looking for Bag Filter Systems ?